Designing for the virtual classroom doesn't need to be difficult - but designers do need a working knowledge of the features and tools each virtual classroom platform provides. In this white paper you'll find high-level summaries of virtual classroom tools, including chat, breakout rooms, whiteboards, application sharing, synchronized web browsing, and survey and feedback tools. Why do you need to know about these tools? Because the virtual classroom is NOT the same as the traditional classroom, and you need to be able to adapt your engagement techniques in order to create meaningful, learner-centered programs. 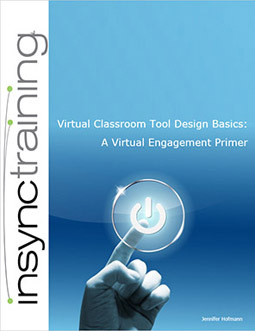 To receive your complimentary copy of Virtual Classroom Tool Design Basics: A Virtual Engagement Primer, please complete the form.